When planning an outfit, I think everyone has their own system. Some people start with shoes and work their way up, some may start with a statement piece of jewelry and build around it, others may just blindly grab pieces and hope they all work. Whatever your system is, there is one thing that should always be considered, your under garments. With so many different materials out there along with styles that range from tight and short to long and flowy, wearing the right unmentionables is necessary. Today, with help from my friends at Kohl’s, I am going to share what I wear under some of my most worn items. While unmentionables are usually a private matter, it’s totally something I would discuss with my girlfriends and well, I feel like you (my readers) are my girlfriends so I don’t mind letting you in on my little secrets! Mike travels a lot for work and we are generally very busy during the week so having one night carved out for “date night” is essential. We will often get dressed up and go out for a cocktail before a late dinner at one of our favorite spots. It gives us a chance to just be with one another and feel like we are back to our dating days! I choose to wear a lacy black pair under my pleated black dress. They are so comfortable which is perfect for walking around downtown and the lace can’t be seen beneath the pleats. Plus the romantic lace pattern make me feel extra beautiful, even though only I know what’s there. I try my hardest to get to the gym at least 3 times a week but hope to get there 4 times a week. I’m constantly trying new workout classes and different gym workouts I find on Pinterest. 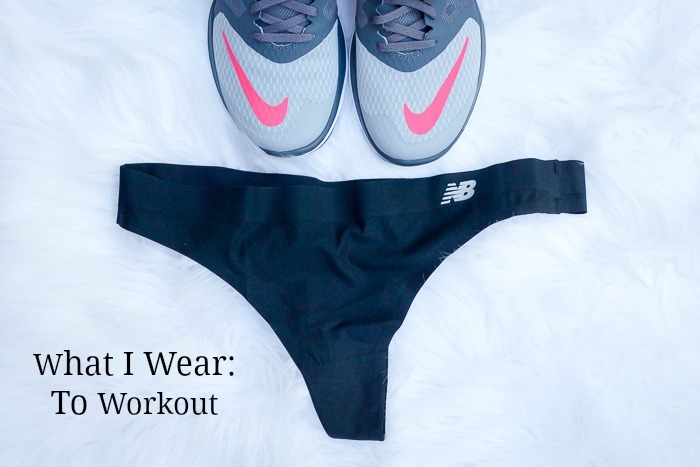 Throughout all of this, I realized that what I wear to the gym matters. You don’t want to be readjusting yourself in between each set, or worse, in the middle of cardio. I will admit, it took me far too long to cave and buy under garments from actual work out brands. For years now I have been specific in what I like to wear when I work out, tight capris and a fitted tank top, and notice such a different in my comfort level while working out. So long are the days of an oversized t-shirt and Nike shorts (#college), I’m much more comfortable now. So it only makes sense to add ‘sport’ to your unmentionables and I’m so glad I did. They don’t ride up, they stay in place, and they even wick away moisture. It’s a whole new world. If you’ve followed my blog for any sort of time, you’ll know that I am a dress girl. In almost any situation I would much rather wear a dress than shorts/pants/skirt. They are easy, comfortable, and girlie which are three of my favorite things. However, I’ve found that with many summer dresses I struggle with what to wear underneath. They are often sheer or light weight material and finding something that doesn’t show through is a challenge. After trial and (embarrassing) errors I’ve found what works best for me is to stick with skin colored undergarments. No matter the color of the dress, they don’t show through since they blend right in with your skin. I also prefer the ones with a lace waist band, they are more forgiving and don’t give you cuts that show through your dress. They are probably my most worn and purchased pair. Don't forget Kohl's Semi-annual Intimates sale this August! Thank you to Kohl’s for sponsoring this post! As always, all opinions are my own.